Choosing a good gaming monitor on a limited budget can be quite challenging. The sub-$200 class is heavily contested and there are many great options available, for both console and PC gamers. In this article, we’ll dive deeper into the pixels, milliseconds, and Hertz to pick out the best gaming monitor under $200. How big should a gaming monitor be? 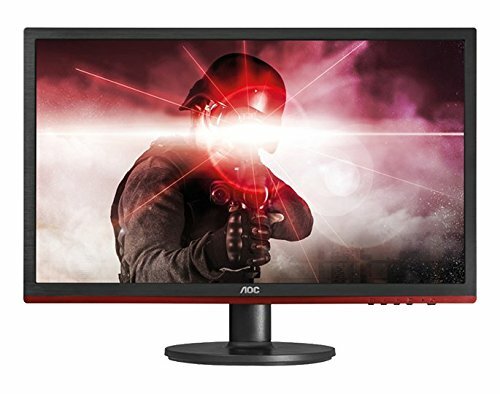 What resolution should my monitor have? What is the optimal refresh rate? 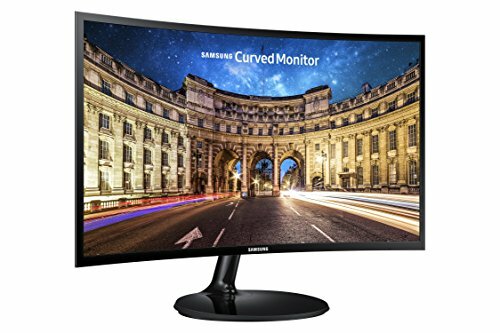 Which connectivity options should my monitor have? What is the optimum response time? What panel type is best suited for gaming? What are FreeSync and G-SYNC? The first model on the list comes from one of the biggest brands in the world of electronics – Samsung. It is a 24” LED monitor with a curved design (1800R curvature) and a regular widescreen aspect ratio of 16:9. The monitor sports elegant styling, slim edges, and a simple circular stand. This is one of Samsung’s strongest offerings in the budget class. The IT LC24390FHNXZA comes in with a curved 24” display which, size-wise, puts this in the middle class. Unless you’re accustomed to exceptionally large monitors, you should have no problem with this one. The resolution of this monitor is 1080p. At 24” diagonal, the IT LC24390FHNXZA has the optimum size/resolution ratio for a 1080p monitor. While the Full HD (1920p x 1080p) resolution might soon become obsolete, it is pretty common for modern 24” gaming monitors. The IT LC24390FHNXZA has a default refresh rate of 60Hz. While it’s nothing to brag about, the Samsung makes up for it with excellent picture quality and smooth running. In any event, the refresh rate can be raised to 72Hz. Connectivity is not one of the strong points of this monitor. The back panel is equipped with one HDMI port and one VGA port. More advanced options, such as DisplayPort and DVI/DVI-D have been omitted. This monitor also features a standard 3.5mm audio output. The response time of 4ms is within the standards for monitors with VA panels. Unless you’re accustomed to faster response rates, you should have no problem with this 24” Samsung. The IT LC24390FHNXZA features AMD’s FreeSync. While great if you run an AMD GPU, this feature is incompatible with NVidia graphic cards. It also has Eye Saver Mode which reduces blue light emissions and flickers. Other notable features include low adjustability and VESA compatibility. It is also worth noting that the monitor does not have any speakers built in. While certainly not able to compete with high-end monitors, this Samsung will give you good bang for your buck. It offers great picture quality, AMD’s FreeSync, slim edges (great if you want to use two or three of them side by side), and classy design. Also, it is wall-mountable (75mm x 75mm base). A lack of connectivity options and the exclusion of onboard speakers are the Samsung IT LC24390FHNXZA’s weakest points. The 60Hz refresh rate makes it unsuitable for fast-paced games. 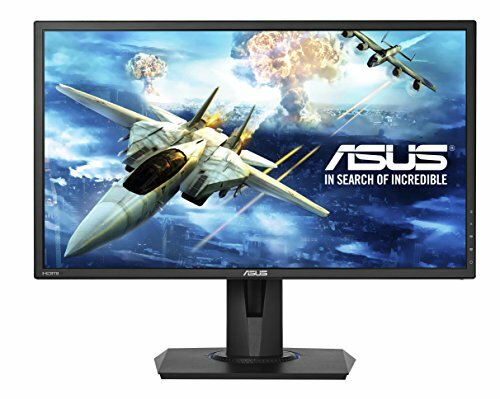 The ASUS VG245H is a 24” LED backlit monitor with Full HD 1080p resolution at 75Hz. It is a sleek monitor with slim edges, matte black frame, and modern styling. The VG245H is a budget class monitor aimed at budget-minded console and PC gamers. The VG245H is a medium-sized monitor made for both casual and competitive gaming. The main features include 1080p resolution, TN panel technology, built-in speakers, dual HDMI ports, 75Hz refresh rate, and 1ms response time. Full HD resolution, while nothing new and impressive, is the most common top resolution in the sub-$200 class. Combined with a 24” diagonal, the 1920x1080 resolution offers a pleasant visual experience. With a refresh rate of 75Hz, the ASUS VG245H is more than adequately equipped for console use. But if you use it with a PC rig, you might experience problems with fast-paced games. The ASUS VG245H has two HDMI ports, one VGA port, and 3.5mm audio in and out jacks. It lacks the more advanced connectivity options, such as DisplayPort and DVI/DVI-D ports. With a miniscule response time of only 1ms, the VG245H stands out in its price class. Thanks to the super-quick response, transitions on this monitor are crystal clear and blur-free. While a great feature, it’s often paired with 60Hz-75Hz refresh rates standard in this price range, as is the case with this monitor. The VG245H uses AMD FreeSync to battle screen tearing and frame rate problems. So, if you opt to use this monitor on a PC, make sure it has an AMD graphics card as FreeSync technology is incompatible with NVidia products. This monitor also has a pair of built-in 2W speakers. As could be expected in this price class, their sound quality leaves a lot to be desired. Therefore, the use of external speakers or headphones is recommended. ASUS’s EyeCare technology minimizes blue light emissions and flickering. The VG245H also boasts ASUS-exclusive GamePlus/GameVisual technology for enhanced in-game visuals. GameFast Input technology cuts input lag down to a minimum. The finest points of ASUS VG245H include lightning-fast 1ms response, exceptional adjustability (pivot, swivel, and tilt), ASUS-exclusive performance-enhancing technologies, and AMD FreeSync. It is also worth noting that the 1080p resolution combined with 75Hz refresh rate is more than enough for console gaming. On the flipside, the VG245H has low quality speakers and somewhat limited connectivity. If you intend to buy this monitor to play fast-paced PC games, you might find the 75Hz refresh rate a bit low. Also, it is recommended to use external speakers or headphones instead of the built-in speakers. 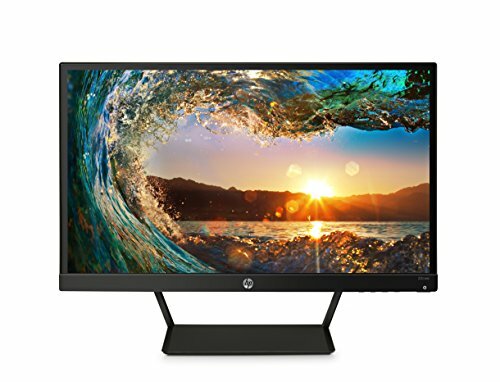 The 22cwa monitor is a 21.5” monitor from HP’s famous Pavilion line. This is one of the most basic models in the series, as well as one of the smallest. It offers an LED-backlit display, simple design, and basic adjustability. The 22cwa is also the most affordable monitor featured in this review. 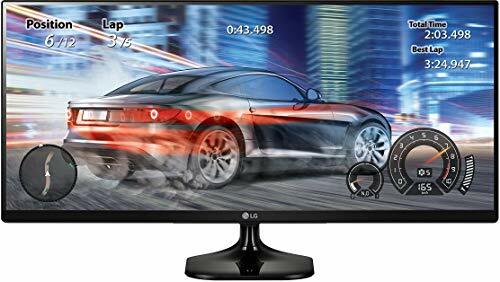 The highlights of this budget-friendly monitor include Full HD display resolution at 60fps, super wide viewing angle (178°), standard 16:9 aspect ratio, and 7ms response time. It doesn’t have any performance-enhancing technologies or speakers. Resolution is one of the few categories where this model can compete with the rest of the models on this list. It is 1080p, which is a good match for the 21.5” diagonal display. Refresh rate is something 22cwa owners can’t brag about. At 60Hz, it is good for console gaming. PC gamers, on the other hand, might find it less than satisfactory if they’re inclined towards fast-paced games. As for connectivity, this 21.5” Pavilion model sports only VGA and HDMI ports. DisplayPort and DVI/DVI-D ports are not part of the package. The 7ms response time is another unimpressive feature of this monitor. It is slow even for an IPS panel display (4ms response time is average for IPS models). The HP Pavilion 22cwa does not feature AMD FreeSync. Also, it has no technologies to battle blue light emissions and flickering. This monitor can only be tilt adjusted. It is VESA-compatible at least. The strongest point of this monitor is its super low price tag. Apart than that, it offers good enough image quality to satisfy gamers on a tight budget. The 7ms response time is too slow, even for the budget class, as there are slightly more expensive models with 2ms-4ms response rates. On top of that, the 22cwa lacks speakers and connectivity options. Like the vast majority of models featured in this review, BenQ’s GL2460HM comes in with a 24” display diagonal. The GL2460HM is an LED-backlit monitor with a simple and somewhat bland design. It features the standard 16:9 aspect ratio, as well as Full HD 1080p resolution. The BenQ is among the more affordable options, oriented towards gamers on a tight budget. The BenQ GL2460HM offers a smart combination of advanced and budget-friendly features. On the advanced side, there are DVI port, VESA compatibility, fast response rate, and EyeCare technology. The 1080p resolution and 60Hz refresh rate are inherited from the budget side of the family. It also has a pair of onboard 2W speakers. With the arrival of 1440p and 2160p formats, 1080p is slowly becoming obsolete. Nonetheless, the 1920 x 1080 resolution works just fine on 24” diagonal. The refresh rate is less than impressive, to say the least. At full resolution, it is only 60Hz. This makes the GL2460HM a somewhat unsuitable option for PC gamers who intend to use it for fast-paced games. In the connectivity department, this affordable BenQ offers HDMI and DVI options. It also sports a 3.5mm audio output jack on the back panel. There’s also the good old VGA port. 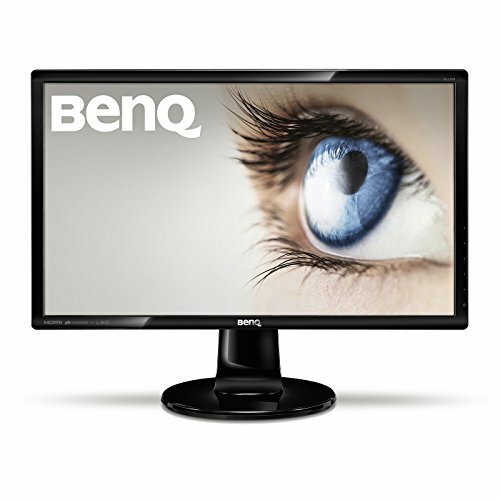 The BenQ GL2460HM features IPS panel technology and is, thus oriented towards speed. It features 2ms response rate, which comes at the cost of slightly lower picture quality. But it’s only visible only when compared to a quality NT monitor. This monitor doesn’t support AMD FreeSync. However, the GL2460HM does come with EyeCare technology which minimizes blue light emissions and eliminates flickering. Additional features include a pair of built-in 2W speakers. As it is to be expected of a super affordable monitor, the speakers offer less than satisfactory performance. The use of external speakers or headphones is recommended. The BenQ GL2460HM offers overall good performance for the money. Its strongest points include 2ms response rate, inclusion of DVI port, and EyeCare technology. VESA compatibility is another good side of this affordable 24-incher. On the other hand, the drawbacks include unimaginative design, lack of AMD FreeSync, and poor speaker quality. Also, 60Hz refresh rate might be less than optimal for PC gamers who play fast-paced games. The Viotek HA238 is an LED monitor with 1920 x 1080 Full HD resolution, 24” display diagonal, and modern, minimalistic design. This monitor also rocks an ultra slim construction and minimum bezels on the sides and the top. The HA238 is an affordable monitor, roughly in the same price class as the BenQ model. The HA238 is a modern-looking monitor, made primarily for those gamers who are looking to assemble a multi-monitor setup on a budget. The main features include 1080p resolution at 60Hz, standard 16:9 aspect ratio, and light weight. The 1080p is pretty standard fare for budget-oriented 24” monitors and the HA238 is no different. In any event, many middle and upper-class 24” monitors also have the good old Full HD resolution. The main reason is that 1080p and 24” diagonal suit each other very well. While the 1080p resolution is completely fine for both console and PC gaming, the 60Hz refresh rate leaves a lot to be desired when it comes to PC gaming. If you like to play games with high frame rates, this might not be a good solution for you. The Viotek HA238 delivers a pretty standard setup in the connectivity section, sporting only VGA and HDMI ports. DisplayPort and DVI options are not included. The same goes for audio input/output jacks. The response time might be the weakest spot of this otherwise decent monitor. At 14ms, it is by far the slowest one on the list. That being said, this monitor is not recommended for gamers keen on fast response rates. The HA238 does not support AMD FreeSync. Other performance-enhancing technologies such as EyeCare and Low Blue Light are also missing from the specs list. Due to its super-slim design, this affordable monitor has no built-in speakers. The Viotek HA238’s strongest points include modern design and lightweight construction. The bezel-less frame makes it great for multi-display setups. Crystal clear picture is also among the HA238’s highlights. While an overall decent budget monitor, the HA238 leaves a lot to be desired. Its 14ms response rate borders on unacceptable and the 60Hz refresh rate tilts it towards console gamers. This model also lacks connectivity options and is not VESA compatible. 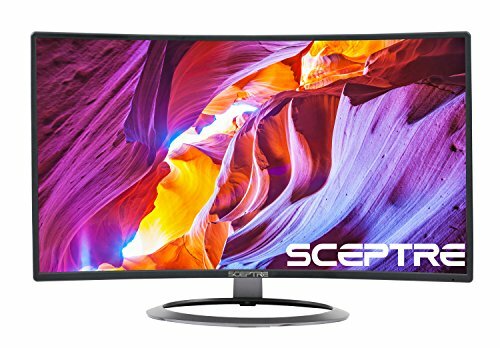 The next monitor on the list is the Sceptre C248W. 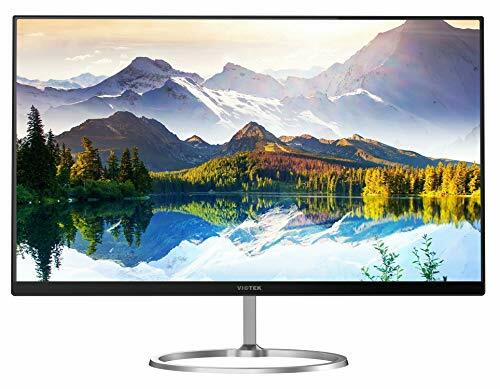 This is a curved monitor with 1800R curvature, standard 24” display with 16:9 aspect ratio, hyper-modern design, lightweight construction, and great connectivity options. The Sceptre C248W, like the other models on this list, offers a mixed bag of features. Among the advanced features are DisplayPort, ultra-thin construction, built-in speakers, and 1800R display curvature. On the budget side, it offers the standard 1080p resolution, 75Hz refresh rate, and 5ms response time. The Full HD resolution is a standard feature on affordable 24” monitors, with 1440p and 2160p being reserved for bigger and more expensive models. That being said, only players accustomed to Super HD and Ultra HD will have issues with 1080p. The Sceptre’s refresh rate, though far from mind-blowing, is a pretty decent 75Hz. While it may be too slow for fast-paced games, it will get you through most slow to mid-paced games without a problem. The C248W features the basic VGA port in addition to HDMI and DisplayPort. It also has a pair of 3.5mm audio jacks (in/out) for the speakers. With a response time of 5ms, this affordable Sceptre is just outside the 1-4ms range that many gamers consider optimal. While it may present an issue for competitive players, casual gamers will not notice it. This curved monitor does not feature AMD FreeSync. Also, it lacks other performance-enhancing features, such as EyeCare and Low Blue Light. The C248W has a pair of built-in speakers. They’re located on the back and facing upwards. The sound quality is low, rendering them virtually unusable for serious gaming. This Sceptre is a quality budget option. Its strongest points include enough inputs and curved display. It also features a modern design with very thin edges, which makes it suitable for setups with multiple monitors. On the other side, the C248W is equipped with a pair of futile and virtually useless speakers. It also lacks AMD FreeSync and other performance-enhancing technologies. The KG241Q comes from one of the biggest manufacturers of PC monitors and PC accessories – Acer. It is a budget gaming monitor aimed at both PC and console gamers. This affordable Acer offers sleek modern design, 23.6” display, and 1080p resolution at 75Hz. As is to be expected, this 23.6” Acer offers a mix of premium and budget features. The highlights include AMD FreeSync, Acer’s VisionCare technology, VESA-compatibility, good adjustability, and super-fast 1ms response time. On the other side, it has the standard 1080p resolution, 75Hz refresh rate, stock speakers, and limited connectivity options. The KG241Q pairs 23.6” diagonal with the standard 1920 x 1080 resolution. While nothing to rave about, the 1080p will see you through any game on any platform. At 75Hz, the refresh rate of this monitor is within the average of the sub-$200 class. Only a handful of monitors in this class will have faster refresh rates. While perfectly fine for console games, you might experience a somewhat weaker performance with hi-spec PC games. In the connectivity section, Acer’s KG241Q offers a pretty standard set of options. Video signal inputs include two HDMI ports and a VGA port. The DVI and DisplayPort options are missing. 3.5mm in/out jacks are also included. The 1ms response time is one of the highlights of this monitor. It enables very smooth and seamless transitions without ghosting and smearing. Along with the AOC G2460VQ6 and ASUS VG245H Full HD, it is the fastest monitor on this list. The Acer comes with AMD FreeSync, which enables the frame rate to be dictated by your GPU, instead of the monitor. Also, it features Acer’s own ComfyView technology which eliminates flickers. The built-in speakers are quite good, considering the price tag. They’re 2W units equipped with 3.5mm in and out jacks. The Acer KG241Q is a quality monitor and one of the finest options available in the budget class. Its best features include AMD FreeSync, 1ms response time, and VESA-compatibility. This is a versatile monitor, being equally suited for both console and PC gaming. On the other side, connectivity is probably the KG241Q’s weakest link. It lacks DVI and DisplayPort. Also, as a TN monitor it has less-than-stellar color quality and somewhat narrower viewing angles. Other than these, this well-rounded monitor has no major flaws. 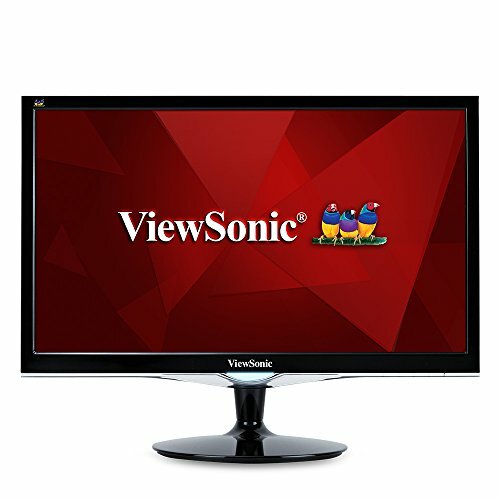 The ViewSonic VX2452MH is a 24” LED gaming monitor. It competes in the budget class and is one of the best ViewSonics in this price region. The VX2452MH brings with it simple and elegant design and great connectivity. Also, it is VESA compatible. The highlights of this budget-friendly 24-incher include Full HD resolution, a fast 2ms response time, DVI port, 75Hz refresh rate, and 2W stereo speakers. It also features ViewSonic’s Game Mode for enhanced in-game visuals. With Full HD resolution and 24” diagonal, this monitor is well-suited for both PC and console rigs. The Refresh rate peaks at a pretty average 75Hz. This might make the VX2452MH unsuitable for fast-paced PC games. Console gamers should be no problem. As far as connectivity is concerned, this ViewSonic monitor offers HDMI, VGA, and DVI video ports. It also has 3.5mm audio jacks for the onboard speakers. The response time of 2ms is pretty impressive for a budget monitor. Both casual and competitive players will find it satisfying. There’s no AMD FreeSync on this monitor. However, it does come with ViewSonic’s own Game Mode technology for improved in-game visuals. The VX2452MH comes with a pair of 2W stereo speakers. The sound, while far from mind-blowing, is rather decent for the monitor’s price class. The ViewSonic VX2452MH is an overall solid option, both for console and PC gamers looking for a budget monitor. Its strongest point include 2ms response time, VESA compatibility, ViewSonic’s Game Mode, and DVI port. On the flipside, this monitor has limited adjustability. It also lacks AMD FreeSync. The AOC G2460VQ6 is an elegant gaming monitor with a 24” LED backlit display. It is AOC’s strongest offering in the under-$200 class. Streamlined design with red accents, Lightweight construction, VESA compatibility (100mm x 100mm base), and good adjustability make it a player-friendly monitor. Low-cost gaming monitors usually come with a mixture of budget-oriented and premium options. On the premium side, the AOC G2460VQ6 boasts a lightning-fast response time, advanced connectivity options, AMD FreeSync, Anti-Blue Light Technology, VESA compatibility, and 50,000,000:1 contrast. The budget side consists of Full HD resolution and an average refresh rate. 1080p resolution is the standard in the sub-$200 class, as well as among more expensive 24” monitors. While not the fanciest out there, it is more than suffice for both casual and competitive gaming. The refresh rate peaks around 75Hz which is pretty standard fare for a monitor under $200. While not bad, it might prove insufficient if you intend to play high-end PC games. Console gamers should not have any problems. This 24” AOC comes with exceptional connectivity. Available ports include 1 x VGA, 1 x HDMI, and 1x DisplayPort. On the audio side, the G2460VQ6 is equipped with 3.5mm audio input and output jacks. There’s also a USB hub on the back panel. The response time is the highlight feature of this AOC model. It is only 1ms, thanks to the TN panel technology. Despite being a TN monitor, it has a 170° horizontal viewing angle and 160° vertical viewing angle. The G2460VQ6 comes with AMD FreeSync technology which helps eliminate image tearing and stuttering. It also features AntiBlueLight and FlickerFree technologies. These are AOC’s own solutions for minimizing blue light emissions and eliminating flickering. The AOC also features a set of two onboard speakers. These offer somewhat low sound quality and are best bypassed with a set of quality external speakers or headphones. The G2460VQ6 is a great low-cost option that happens to have some quality features. Some of its strongest points include 1ms response rate, AMD FreeSync, AntIBlueLight and FlickerFree technologies, exceptional connectivity, and a 4-port USB hub. The downsides include low-quality speakers and somewhat poor initial color calibration. The color calibration, however, can be easily fixed and brought to a satisfactory level. The last model featured in this review is the LG 25UM58-P. It is a 25” monitor with ultra-wide 21:9 aspect ratio. The 25UM58-P belongs in the sub-$200 class and is one LG’s strongest low-cost options. Considering the price class that it competes in, the 25UM58-P sports a combination of budget-oriented and premium features. On the premium side, there are ultra-wide aspect ratio, Split Screen 2.0 technology, super-thin bezels, and game mode technology. On the flipside, this affordable model only has average response time, Full HD resolution, average refresh rate, and limited connectivity. Due to the aspect ratio, the Full HD resolution is 2560 X 1080 instead of the standard 1920 x 1080. Nonetheless, it is still the good old Full HD and should suffice for both console and PC gaming. The refresh rate of 75Hz is also more than enough for console gaming. On the other hand, PC gamers who enjoy fast-paced games might need a 144Hz monitor. While connectivity is far from impressive, it is passable. The 25UM58-P comes with a pair of HDMI ports but no VGA or DisplayPort. It also has a 3.5mm audio out. The response time is pretty good, considering that this is an IPS monitor. At 5ms, it is far from sensational. However, it should be enough for non-competitive gamers on both console and PC platforms. While it doesn’t feature AMD FreeSync, the 25UM58-P rocks a selection of LG’s own technologies. These include Split Screen 2.0, Game Mode for enhanced in-game performance, and Black Stabilizer which enhances details during dark in-game scenes. Even though it has a 3.5mm audio out, this ultra-wide LG monitor has no built-in speakers. The audio out is for pass-through only. The 25UM58-P’s strongest points include its ultra-wide aspect ratio, Split Screen 2.0 technology, Game Mode, and Black Stabilizer. Also, the thin bezels look great on this monitor. Major downsides include lack of input options, AMD FreeSync, and built-in speakers. Gaming monitors come in many shapes and sizes and an almost limitless variety of features. Depending on what they offer and what they’re intended for, their price tags can range from under $100 to well over the $1,000. The price of a monitor is largely determined by the display quality and features. When shopping for a budget gaming monitor, however, you should determine which features are your priorities and what are your must-haves. Some of the most common factors to consider include size, display resolution, refresh rate, connectivity options, response time, display panel type, and performance-enhancing technologies, if any. Read on if you’d like to know how to select the best gaming monitor under $200. You will find the buyer’s guide presented in Q&A format. While the first impulse might tell you that the bigger the better, it is not always the case. Gaming is one such example. Gaming-oriented monitors usually range from 21” to 27”, with 24” being the middle ground. You will rarely find monitors outside this range used for serious gaming. Most casual gamers also gravitate towards monitors in this range. 24” displays are the most popular as well as the most populous group of budget-friendly monitors. Why? 24” monitors (this also goes for the rest of the 21”-27” range) offer great ratio of display clarity and viewing comfort. Anything too big and you would need to move away from the monitor. On the other hand, if you play on a monitor that’s too small, your playing experience might suffer. After deciding on the monitor size, you should consider the monitor’s resolution. Today’s monitors come with several standard resolution options. The lowest tier is 720p. This is also called HD Ready and is almost completely obsolete. You shouldn’t consider 720p monitors for gaming. Next on the menu is 1080p or Full HD. This is the most standard resolution found on monitors today, regardless of the price tag. Consequently, it is the most common option in the budget class. Keep in mind that 1080p resolution is the best fit for a 24” monitor. 1440p or QHD is the next level up. While requiring considerably larger monitors for optimum viewing, 1440p resolution also requires better hardware. QHD resolution is best paired with 27”-32” monitors. Finally, there’s the 4K or 2160p option. This one’s reserved for the most expensive and advanced monitors far beyond the budget class. Also, it requires 32+” monitors and high-end gaming rigs for optimum performance. Refresh rate is another important aspect to consider when buying a gaming monitor. The most common options today include 60Hz, 75Hz, 144Hz, and 240Hz. All except 240Hz are within the confines of the budget class. 60Hz refresh rate is the standard today seen in the vast majority of gaming monitors, especially those in the budget class. This refresh rate is more than ok for console gaming and moderate-paced PC games, but it’s insufficient if you intend to play fast-paced PC games. 75Hz is the next tier. While representing a 25% increase in frequency, it still offers pretty much the same usability as the previous option. 144Hz refresh rate is good for both casual and competitive gaming. Monitors with this refresh rate should have no problems with even the most demanding games out there. Of course, if you opt for a 144Hz monitor, you should have a powerful machine. 240Hz refresh rate is reserved for premium monitors. Needless to say, only the top-tier rigs can support a 240Hz monitor to its full potential. Monitors can have a wide variety of ports and connectors. The four most common video connectors are HDMI, VGA, DVI, and DisplayPort. VGA is the oldest among them. It is on the edge of obsolescence. It is video-only and the maximum supported resolution is 1080p. The vast majority of budget displays will have a VGA connector as a backup option. HDMI (High-Definition Multimedia Interface) transfers both audio and video. Popular variants include HDMI 1.4 and 2.0, with the 2.0 option being able to run 1440p and 2160p resolutions at high frame rates. HDMI is the current standard when it comes to multimedia connectivity and every budget monitor has at least one. DVI is not nearly as prominent as HDMI, though it can be found on select budget monitors. It is a video-only connector and offers similar performance. DisplayPort is another video transfer option. Like DVI and VGA connectors, it only transfers video. However, despite the lack of versatility, it is very popular among gamers. This connector easily supports 2160P videos at 120Hz. It is a computer-exclusive connector, being unavailable on consoles. Some budget monitors might feature a DisplayPort in addition to VGA and HDMI ports. Audio inputs and outputs on affordable monitors are usually handled through 3.5mm audio jacks. Even though HDMI port can transfer audio, if a monitor has built-in speakers, it will also have 3.5mm connectors. Response time determines the smoothness of motion on your monitor. The lower it is, the smoother the transitions between frames. On the other hand, long response time causes motion blur. With that in mind, it is important to choose a monitor with a low response time if you want to use it for gaming. The most common range today is 1ms to 4ms and many inexpensive monitors fall within that range. Whichever you choose, you should not have problems with motion blur. Even those monitors with 5ms response time should offer satisfactory performance. However, if you go above 10ms, poorer performance can be expected. Gaming-oriented monitors fall use two panel types – IPS stands for “In-Plane Switching,” while TN and IPS. TN stands for “Twisted Nematic,” and each comes with its own advantages and drawbacks. IPS monitors will give you better image quality and richer colors, but higher response times. These monitors can’t get below 4ms response time. On the other hand, TN monitors will have shorter response times and higher refresh rates at the expense of image quality. TN monitors can reach as low as 1ms response time. When choosing between the two, ask yourself what is more important to you – performance or visual experience? FreeSync and G-SYNC are technologies which prevent screen tearing while you play games. They were developed by AMD and NVidia, respectively. FreeSync only works with AMD graphic cards, while G-SYNC is only compatible with NVidia GPUs. FreeSync is free, while you have to pay for G-SYNC. Due to it being free, FreeSync is the only adaptive sync option available on low-cost monitors. 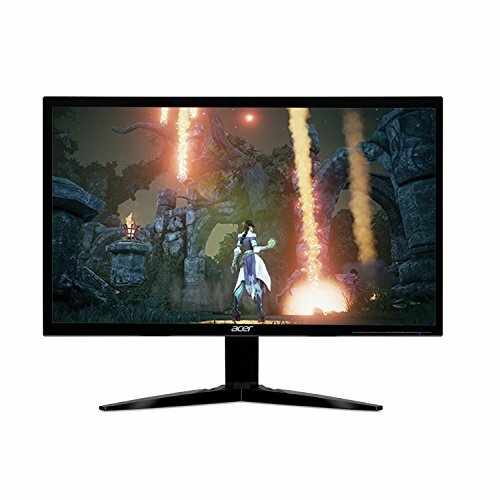 If you happen to have an NVidia graphics card and are on the hunt for a budget gaming monitor, steer clear of those with FreeSync. After all is said and done, it is time to pick the best of the best gaming monitor under $200. The winner is the AOC G2460VQ6, also known as just the VQ6. This excellent gaming monitor offers many great features. Some of them include ultra-fast 1ms response time, AMD FreeSync, and the modern DisplayPort. It also features a 4-port USB hub on the back panel, good adjustability, and VESA compatibility. In addition, you’ll appreciate the AOC’s sleek, modern design. The best option for players on a really tight budget is Sceptre’s C248W. This curved monitor has a 24” display, 75Hz refresh rate, Full HD resolution, and DisplayPort. It is also equipped with a pair of speakers and is great for multi-monitor setups.